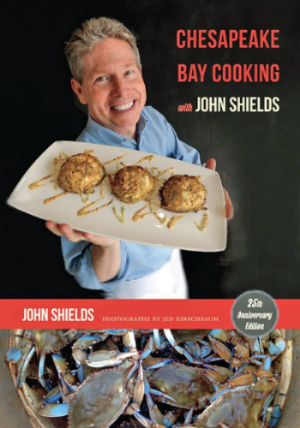 Twenty-five years ago, Chesapeake Bay Cooking with John Shields introduced the world to the regional cuisine of the mid-Atlantic. Nominated for a James Beard Award, the book was praised for its inspiring heritage recipes and its then-revolutionary emphasis on cooking with local and seasonal ingredients. Part history lesson, part travelogue, the book captured the unique character of the Chesapeake region and its people. In this anniversary edition, John Shields combines popular classic dishes with a host of unpublished recipes from his personal archives. Readers will learn how to prepare over 200 recipes from the mid-Atlantic region, including pan-fried rockfish, roast mallard, beaten biscuits, oyster fritters, and Lady Baltimore cake. Best of all, they’ll learn everything they need to know about crabs—the undisputed star of Chesapeake cuisine—featured here in mouthwatering recipes for seven different crab cake recipes. Extensively updated, this edition includes a new chapter on Chesapeake libations, which features Shields’s closely held recipe for his notorious Dirty Gertie, an authentic Chesapeake-style Bloody Mary. Add a Gift Card from Gertrude's to your book purchase for a truly thoughtful gift.